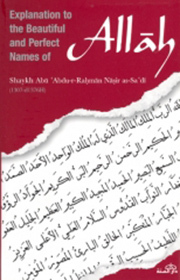 To Allah belong the most beautiful and perfect Names, so invoke Him by them. Abandon those who desecrate His Names, they will be recompensed for what they did.? From the most noble and lofty stations of cognisance is to know the Lord, the Glorious, through His beauty. This is the knowledge possessed by the elite of this creation. All of them know Him through an Attribute from amongst His Attributes but those amongst them who have the most complete cognisance are those who have most complete cognisance are those who know Him through His perfection, magnificence and beauty. These is nothing comparable to Him in any of His Attributes, if you were to assume that the whole of creation was in its most exquisite form, and you were to try and compare their collective outward and inward beauty to the beauty of the Lord, Glorious, the comparison would be more ineffectual than a faint torch being held against the blazing disk of the sun. It is sufficient to know of His beauty that if His veil was lifted, everything that splendour of His Face fell upon of His creation would be obliterated. It is sufficient to know that all beauty, external and internal, to be found in this world and the Hereafter is from the resultant effects of His works, so what then would one think of the beauty to know of His beauty that to him belongs nobility in its entirety, strength and power in its entirety, generosity and kindness in its entirety, beneficence in its entirety, knowledge in its entirety and grace in its entirety.